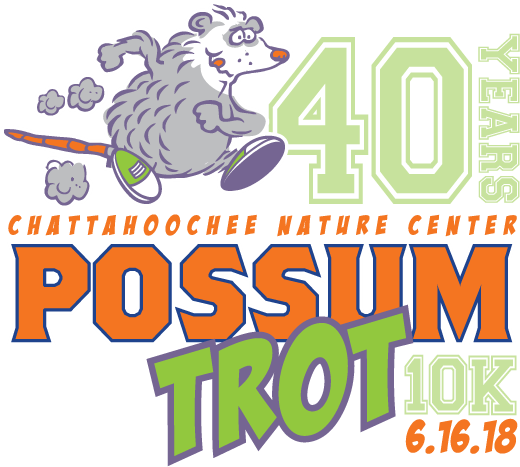 The 40th Annual Possum Trot 10K takes place on a flat, fast and scenic course along the banks of the Chattahoochee River in Roswell, GA. This is a point-to-point course with beautiful views of the Chattahoochee River National Recreation Area. The race starts 1/2 mile west of the entrance to the Chattahoochee Nature Center (CNC) on Willeo Road, turns onto Azalea Road and loops back once reaching Roswell Road/Alpharetta Hwy. The race ends at the entrance of the Nature Center. The event also includes a post-race awards party at CNC's Ben Brady Lakeside Pavilion which includes music, give-aways and awards in 13 age groups. This is a qualifier for the Official AJC Peachtree Road Race Qualifying Event. This is a fun, summer run and an Atlanta tradition for 40 years. The race is limited to 1,500 runners so register early to ensure your spot! 11:00am to 7:00pm - Race # Pick-up and Late Registration - Big Peach Running Co - Marietta store only. Walkers and runners unable to complete the race route in 1 hour and 30 minutes (just under 15 minute pace), may be asked to use the walking path along Azalea Drive after the turn-around point, and may be asked to use the bike lane on Willeo Road once the road is re-opened to vehicle traffic at approximately 8:30am. Race parking is available at CNC prior to Willeo Road closing at 6:00am. Participants who park at CNC will not be able to depart until Willeo Road is re-opened at approximately 8:30am. Additional parking is available at St. Francis School at the corner of Willeo Road and Azalea Drive. This parking is approximately 1/2 mile from the Lakeside Pavilion where you will pick-up race numbers or register on the morning of the race, and an additional 1/2 miles from the starting line of the 10K. We RECOMMEND YOU ARRIVE NO LATER THAN 6:30am at the parking lot, to give yourself enough time to be at the starting line for the 7:00am start time.